Adele wanted to make these firefighters feel her love—so she showed up with cake. In light of the recent Grenfell Tower blaze, which left 79 people presumed dead, the Grammy winner made her way over to the Chelsea Fire Station to thank a group of firefighters for their public service. Ever the gracious visitor, the famous songstress did not show up empty-handed. "She just turned up at the station and knocked on the window and said she has some cakes for us," Chelse Fire Station manager Ben King told reporters. "So we opened the door to her and then she took her sunglasses off and said: 'Hi, I'm Adele.'" The star kept the visit casual and comfortable by sitting down for a cup of tea with the firefighters and partaking in a moment of silence for the victims of the tragic fire. Before leaving, Adele smiled for photos with the group, including one shot that captured the star mid-laugh. Needless to say, the singer was more than welcome at the station. 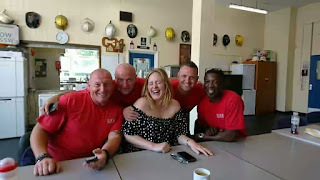 "Not everyday the wonderfully grounded and caring Adele pops into Chelsea Firestation for a cup of tea and a cuddle," King wrote on Instagram. Without publicizing her efforts, the "Send My Love" singer has been showing her love and support for the victims since the fire occurred on June 14. A day after the blaze, Adele discreetly paid a visit to the site of the fire reportedly with husband Simon Konecki. Fan sites also reported Adele asking if anyone needed help in between hugging fans and strangers. Currently, a criminal investigation is under way to determine the cause of the fire.